After yesterday's leaked image, BMW has given us all the details about the new 3-Series Gran Turismo they will officially present in Geneva next month. And not only does it look better than I first thought, but also packs BMW's first active spoiler and some rather impressive luggage space. Give me a week, and it might grow on me even more. Ok, so the bad news is that it has a stupid air intake on its wheel arch. The Bavarians call those "blades" (We refer to them as "bimmerangs," which is their proper name) and claim they reduce air resistance, but I don't believe them. What's great about it? Get ready for some measurements. The 3GT is 7.9 inches longer than the wagon, so it has a 4.3 inch longer wheelbase and is also 3.2 inches taller. How is that great, you ask? It translates to a more spacious interior with a bit of extended headroom and extra legroom over the sedan or the wagon. That's more than you get from a 5-Series, so your children and friends just got happier thinking about a longer trip in the back. Thanks to the 40:20:40 split/folding rear seat with folding head restraints and tilt-adjustable backrests, the GT actually has a cubic foot more luggage space than the wagon. It's also full of LEDs so you see where to put your stuff. Don't worry, the front got more than enough LEDs too! They also made the silhouette of the headlights larger than the sedan to make it more harmonious with the oversized body. It's the same story at the rear, where the L-shaped lamps overlap well into the side of the car. Overall, the profile got much sleeker than what we got (and hated) on the 5-Series GT. The dual exhausts keep the 335i version looking moderately sporty, and that active spoiler which comes up above 68 mph is a nice touch as well. The rest is very much 3-Series like. 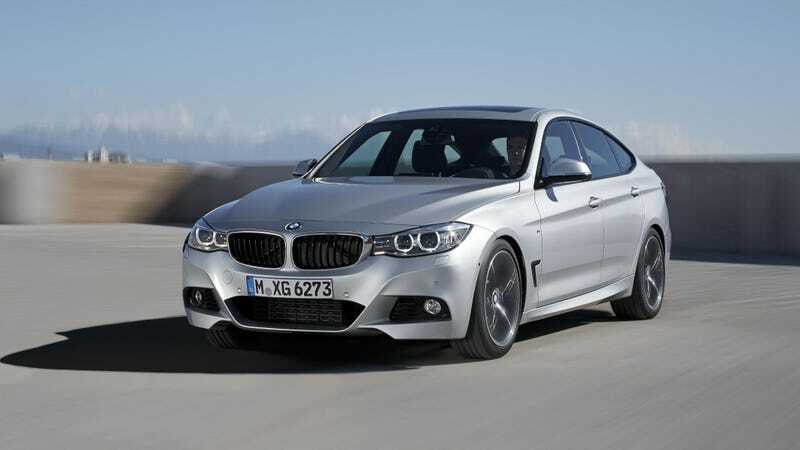 Starting this summer, you can order your 328i GT with the 2-litre twin-turbo four producing 240 hp and 255 lb-ft, or you can go wild an have the 6-cylinder 335i with 300 horses and 300 lb-ft. Europeans also get the smaller 320i petrol and two four-cylinder diesels. A six-speed manual or an 8-speed automatic are your transmission choices. Luckily, the DSC "Off" button remains next to the shifter. The 3-Series Wagon Returns To The U.S.
Prices will be announced later, but expect them to be either slightly higher or lower than the regular 3er.